The street where I grew up has a pretty uninteresting name. No, I won't say exactly what the name is, but I will tell you it is named after the family who built the first house there. Now I think "Brimful" would make a marvelous street name. Out of curiosity, I Googled the name "Brimful" and discovered a Brimful Drive in Phoenixville, PA. Looks like a prosperous area. And there's a street called Curious Place in Lawrence, IN. Speaking of street names, just think how fun it would be to live on a street named Strawberry Hill. Sounds like a very happy spot indeed. Well, Strawberry Hill Court really exists in a place called Stamford, Connecticut, and a little girl once lived there. Lucky for us, that little girl is now author and current Children's Poet Laureate, Mary Ann Hoberman. "Almost as a memoir." That is how she describes the beginnings of her outstanding, new middle grade novel titled Strawberry Hill. 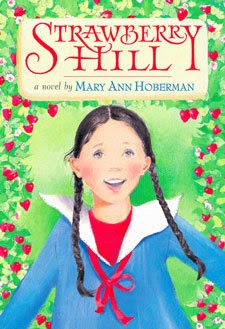 About Strawberry Hill: Allie, a 10-year-old girl growing up during the Depression, must leave her friends behind and move to a new house in a new town so that her father doesn't need to travel as far to work. Upon learning that Strawberry Hill is the name of her new street, she dreams of big, delicious strawberries, green rolling hills and a quaint little gate. Unfortunately, at first, Strawberry Hill doesn't exactly live up to her expectations and meeting kind, new friends is easier said than done. Call me nostalgic or old-fashioned, but I simply adore this book with its wholesome qualities and vintage feel. Strawberry Hill is set during the Great Depression, and Hoberman touches on issues related to poverty. Many of the characters obviously face rough times. But the heart of the story lies in Hoberman's portrayal of friendship. Making new friends, attending a new school, keeping friends, and trying to decide what values really matter - Allie is an excellent role model, particularly for preteen girls struggling with friendship. Hoberman also brings up religious differences between the Jewish and Catholic faith, and Allie must react to some anti-Semantic comments. Strong family ties are evident as Allie's parents and little brother play key roles in helping her adjust during her first year in Stamford. The illustrations by Wendy Anderson Halperin were not included in my advance reader copy. My favorite aspect of the book? Kids today can learn a few lessons on how to play without technological doodads. Hoberman mentions all sorts of fun ways to pass time like paper dolls, hopscotch, card games, jump rope, marble, word games, and ball bouncing games. (I want to know where to find a set like Allie's twenty-six alphabet paper dolls!) Teachers take note: the lamb joke is plain good fun, but you'll have to read the book to figure that one out. Fans of the classic stories like Heidi, the historical American Girl book series or old favorites such as Elizabeth Enright's The Melendy Quartet will especially enjoy the book. HersamAcorn.com Article: "Accolades abound for children’s poet"
This sounds like a great book, and I love the cover. I especially like the part you mentioned about passing the time without technology! Thanks for the review! Thanks for sharing. The illustrator is very good. Thanks. I've always loved the idea of naming a place or house where one lives. It seem very English. I would never have guessed by the cover that the book takes place during the depression (I guess what they say about judging a book is true).